Hey boy, you really activate my ventral midbrain. How far away is that pulsar, exactly? Learning: What’s programmed cell-death proteins got to do with it? We have tiny visitors that have taken advantage of their evolutionary squatting rights throughout our bodies; these microbes make up our microbiome. Nobel Laureate Joshua Lederberg best defined the human microbiome as “the ecological community of commensal, symbiotic, and pathogenic microorganisms that literally share our body space”. We are Soylent Microbiome, Soylent Microbiome is US! 1) The Commensals: Commensalism is relationship between two organisms where one benefits without affecting the other, derived from the English work commensal meaning “eating at the same table”. 2) The Symbionts: This is a clear mutualistic relationship, both parties are benefiting, both parties are happiest. We provide love to our microbiome, they provide love back to us (and by love I mean nutrients and protection from harm). 3) The Pathogens: These are the microbes that cause disease. The main distinguishing factor of a pathogen vs. a commensal is that a pathogen causes harm to the host. Maintaining the perfect balance of all 3 of these microbe-types is essential for the equilibrium of the microbiome. An altered microbiome has been linked to depression, obesity, diabetes, anxiety, autism, cancer, rheumatoid arthritis, muscular dystrophy, multiple sclerosis, fibromyalgia and many other negative aspects of being human that we have yet to link. We know one sure-fire way to disrupt the gut microbiome is to treat a human with oral antibiotics. Yes, the cure for most bacterial infection is to wipe out your entire ecological masterpiece you’ve worked on for decades in your gut. Essentially, your commensals and symbionts work together to protect you from the potential harm that can be caused by the pathogens. We don’t understand fully how the protection works, but we do know that the presence of commensals and symbionts are essential for keeping the pathogens at bay. One hypothesis is that your commensals and symbionts are creating a literal barrier between you and the pathogens, and if you wipe out this barrier with antibiotics that is when the scary pathogens take over. In fact, oral antibiotic use is one of the leading risk factors for the disease associated with Salmonella ssp. and Clostridium difficile (C diff). In most cases, Salmonella spp. causes salmonellosis (or food poisoning) and typhoid fever, whereas C. difficile causes antibiotic-associated diarrhea (AAD). In more severe cases Salmonella spp. can cause sepsis and C. difficile can cause “pseudomembranous colitis”, a severe inflammation of the colon. What is it about the disruption of the microbiome by antibiotics that benefits the proliferation of the pathogens? Turns out, sugar availability is at an all-time high for these pathogens when the microbiome is disturbed, specifically an increase in sialic acid (yum!) and fucose (yummier!). The mammalian host is nutrient diverse and rich, allowing for microbial populations to snuggle up and settle in – however the intestinal microbial community (or the microbiota) is composed of trillions of bacterial cells, making nutrient availability a little more stringent for those invaders that try to squat in the gut. Alteration of the microbiome leads to an alteration of the carbohydrate availability in your gut – and the pathogens that are now rattled by the disruption of the microbiome now have unlimited food. Think of Salmonella spp. and C. difficile as Scrooge McDuck rolling around in his pile of money. Katherine Ng in Justin Sonnenburg’s lab at Stanford University found that during oral treatment of antibiotics there is a spike in microbiota-liberated sugars that can then be taken up and eaten by our protagonists, Salmonella spp. and C. difficile to increase their replication and disease in the gut. Specifically, Salmonella spp. are utilizing the liberated sialic acids and fucose from disturbed commensals in the gut after antibiotic treatment, and C. difficile is utilizing the the sialic acids liberated by the same commensals. Interestingly, when you delete these catabolic pathways (metabolic pathways in the bacteria that are used to break down molecules into smaller units for energy) in Salmonella spp. where it can no longer use sialic acid and fucose as carbon sources, it can no longer replicate and cause disease to the same levels in antibiotic-treated mice. Not only that! When you have a mouse with a microbiome that cannot produce sialic acid, therefore it reduces free sialic acid levels, C. difficile no longer causes disease to the same levels after treatment with antibiotics. No free sugars? No good for our protagonists! What if we took these mice that had a microbiome that does not produce sialic acid and we fed them sialic acid in their diet (nom nom), then we treated the mice with antibiotics = C. difficile reigns again! It looks like that usually, when the microbiome is happy, it’s eating all the free sialic acid and fucose and not saving any for the pathogens, which keeps the pathogens at a minimum and less of a nuisance – however, upon antibiotic treatment the microbiome is disturbed, which breaks down the wall of commensal/symbionts blocking pathogens from using these sugars… therefore the pathogens are eating good, replicating, and eventually cause disease. How can we use this information for good? Can we use this insight for new therapeutic approaches to preventing diseases caused by antibiotic-associated pathogens? During treatment with oral antibiotics what if modulated diet to decrease sialic acid and fucose? Decreasing the availability for pathogens in the gut? What if we could give a probiotic that was deficient in sialic acid and fucose production, therefore it would be established in the gut and if/when antibiotic are used and disturb the microbiome there would be minimal free sialic acid and fucose because there was none to begin with? What if we designed an inhibitor that blocked sialic acid and fucose catabolism pathways in the pathogens? Therefore, when antibiotics are used and disrupt the microbiome allowing for pathogens like Salmonella spp. and C. difficile to replicate – we treat with this inhibitor of sialic acid/fucose catabolism, essentially the pathogens could then pick up the sialic acid and fucose from the environment but they couldn’t use is for energy. No energy = no replication = no disease. Those are just a few of my ideas. What about you? Astronomers collect light. That's all they do. They make it into pictures and scatter plots (and histograms and spectra and tables), but everything they figure out comes from photons with different energies, wavelengths, orientations, origins, and hair colors. In celebration of that fact, it's Friday Picture Day. The four images below were released this week and show what astronomers are, at this moment, hunched over computers studying. Where are you going so fast, space object? You look like a ghost or Kirby. But you are not. You are a loosely packed ball of dust and ice screaming through space. You are Comet ISON, and the Hubble Space Telescope took this picture of you when you were 363 million miles from the Sun and 402 million miles from Earth. Oh, you weren't ready to have your picture taken? You're not looking your best yet? I'm sorry. I'm sorry I'm not sorry. Hurry up and get closer to the Sun, and we'll reshoot when the Sun is blowing your gas and dust into tails hundreds of millions of miles long. You're kind of cute now, but by November, you'll look like you've been doping. That pale blue dot with the not-a-real-thing arrow pointing at it? That's Earth -- from 898 million miles away. The Cassini spacecraft, which is currently researching the hell out of Saturn, took images showing 33 different areas of the ring system. One view happened to include our planet. "Happened to include" -- yeah, right. Stop creepin', Cassini. Voila, it's the Whirlpool Galaxy ... and that hanger-on, the galaxy that feels as small as it looks because it is constantly referred to as "the companion galaxy." It's called NGC 5195, you guys. Call it by its name. Treat it the way you would want to be treated. The WIYN telescope at the National Optical Astronomy Observatory's Kitt Peak facility took this picture in one go because it has a fancy new wide field-of-view camera. That's "something that even the Hubble Space Telescope cannot do," the press release said. Not to brag, bro. The Sun's outer atmosphere -- the corona -- is millions of degrees hotter than its surface -- the photosphere. Which doesn't seem to make sense because heat can't flow from a colder thing to a hotter thing, but the corona must be getting heat somehow. Astronomers want to learn more about the transition area between the photosphere and the corona. The Interface Region Imaging Spectrograph (IRIS), which opened its little mechanical eyeballs for the first time July 17, took this image of two sunspot regions (dark patches in the upper left and lower right). The observatory sees three different bands of ultraviolet light and snaps an image every 10 seconds. Through this high-speed, intensive project, scientists are hoping to figure out what the F is going on over there. I know, I'm surprised too.I wanted to think of a very clever title for this epic topic, but I wanted to cut straight to the point. As the antibiotic era is coming to an end due to the emergence of antibiotic-resistant pathogens, it is alarming that we had not sufficiently explored the deleterious side effects that these drugs cause on our own cells. James Collins and his group from the Howard Hughes Medical Institute published last week in Science Translational Medicine (my new favorite journal) a remarkable study that shows antibiotics not only harm bacterial cells, but mammalian cells too. 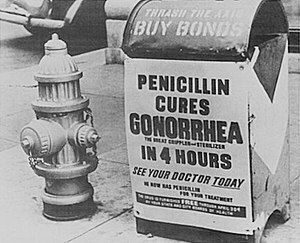 Looking back in time, the term “antibiotics” was first used in 1942 by Selman Waksman to describe any substance synthesized by a microorganism that negatively affects the growth of other microorganisms. Antibiotics inhibit growth of microorganisms through a variety of mechanisms ranging from molecules that bind to ribosomal subunits to inhibit protein synthesis to disruption of bacterial lipid membranes. Generally all of the antibiotics can be categorized into two groups: 1) bactericidal antibiotics and 2) bacteriostatic antibiotics. Bactericidal antibiotics directly kill bacteria (ie; penicillin, which blocks synthesis of the bacterial cell wall), whereas bacteriostatic antibiotics slow their growth or reproduction (ie; a macrolide like azithromycin, which binds to the 50S subunit of the bacterial ribosome to inhibit protein synthesis). Thank you to whoever made this image. Interestingly, in 2007 James Collins and his group released a set of data that suggests that all bactericidal antibiotics have a common mechanism of killing bacteria. This blew our original knowledge of bactericidal antibiotics out the water. Here we’ve been thinking for nearly 7 decades that each individual class of bactericidal antibiotics kill through different mechanisms, but we were wrong? Perhaps (this hypothesis is highly debated, but should not be discounted!). This study suggests that all bactericidal antibiotic killing starts out as an array of diverse disruption mechanisms to throw the bacteria out of homeostatis, but all of these mechanisms have a similar end point – production of “highly deleterious hydroxyl radicals in Gram-negative and Gram-positive bacteria, which ultimately contribute to cell death”. Hydroxyl radicals are highly reactive ions that can damage virtually any type of molecule including DNA, lipids, amino acids… that’s just a taste of what these assassins can target and all three of those things have something in common… they are required for LIFE. Not just bacterial life, ALL LIFE. So if production of hydroxyl radicals can have such a harmful affect on the essential essence of bacteria (DNA, proteins, amino acids, lipids, etc), couldn’t the production of hydroxyl radicals have an affect on these same essentials in mammalian cells? Interestingly prolonged use of antibiotics is associated with various side effects ranging from ototoxicity (damage to the ear due to use of antibiotics like aminoglycosides, which are antibiotics that are bactericidal in high concentrations) to nephrotoxicity (kidney disfunction). Despite these correlations, no real studies have been conducted on the adverse affects of bactericidal antibiotics on mammalian cells! Turns out James Collins and his group show, after intense investigation into this matter, that bactericidal antibiotics (specifically quinolones, aminoglycosides, and beta-lactams) can cause mitochondrial dysfunction and reactive oxygen species (ROS) overproduction in human and mice cells. Turns out hydroxyl radicals are a type of ROS. Whoa mama. Ultimately the over-production of ROS induced damage to DNA, proteins, and membrane lipids leading to tissue damage in the host. Figure: These are sections of mouse mammary gland tissue after treatment with bactericidal antibiotics (ciprofloxacin, ampicillin, and kanamycin), with and without the anti-oxidant N-acetyl-L-cysteine (NAC), or a bacteriostatic antibiotic (tetracycline). The protein damage in the mammary gland tissue is shown by the red arrows pointing to the red dots (anti-nitrotyrosine antibody that measures oxidative protein damage), black arrows point to protein damage to connective tissues. Amazing, but somewhat intuitive, if they gave mice the Food and Drug Administration (FDA)-approved antioxidant (think pomegranates, or don’t apparently that’s not scientifically proven), N-acetyl-L-cysteine (NAC), it completely alleviated all of the scary side affects of these bactericidal antibiotics. There is huge implication for this study on long-term antibiotic treatment or treatment of antibiotic cocktails in the ICU (mostly immune suppressed patients) in which antibiotic regiments may have to be revised – perhaps by supplementing patients afternoon sandwiches with some anti-oxidant containing blueberries? These are simulated stars, not what you're thinking. I know what you're thinking *(see last graphic).It's no secret that when a massive star dies, it often does so dramatically--in a huge explosion known as a supernova. Supernovae outshine entire galaxies and enrich the universe with the heavy elements that are necessary to make those gold chains you wear. It is kind of a secret, though, that scientists don't really know how supernovae happen. When they try to recreate these blasts using simulations, the physical laws plus the physical material don't lead to the explosions we see IRL. Scientists have solid ideas about stars' interiors at the ends of their lives. And good ideas about the reasons stars might choose to ex- instead of implode. But when they put the details of those good ideas together, a) that's a lot of details, b) the combo does not a supernova make. Some supernovae leave behind neutron stars, objects about 1.4 times the mass of the Sun that are crunched down to the diameter of an earthly city and spin up to 716 times per second. They're like gigantic atomic nuclei, if gigantic atomic nuclei were also possessed carousels. So when a massive star dies, the stellar core is collapses inward and the supernova expels material out into space. Current simulations get stuck around the point where the implosion becomes an explosion. But these simulations often are two-dimensional and involve vastly simplified parameters. After all, there are only so many supercomputers (and also only so many people who want to write code that robust). The theory out in front right now says that neutrinos -- high-energy, low-mass particles -- result from the collapse and, in their excitement to leave the star's deathbed, collide mightily with the star's outer layers. The layers absorb the neutrinos' mighty energy, causing a shock wave that results in the actual supernova. With 150 million processor hours, 16,000 cores working in parallel, and 4.5 months of continuous computing, a research team headed in Garching was able to simulate -- for the first time -- a detail-oriented 3D supernova explosion. This simulation produced "many Terabytes" of data, so after those 4.5 months of chugging were over, the work was far from done. After analysis, they found evidence that neutrinos were heating their simulated gas: it was bubbling and producing fat-headed plumes, which convection, fueled by temperature increase, would cause in a fluid. They also saw sloshing, which other scientists have seen and dubbed "Standing Accretion Shock Instability" (SASI). In some other simulations, SASI had just led to more SASI, leaving the researchers with comically sloppy stars that wiggled but never exploded. *These are not alien fetusus hidden for years by the government (Hanke, et al.). SASI had not been observed at all in an ultra-complex simulation like this one, but it's important because it explains asymmetric supernova. If a star is just sitting there one moment and then explodes the next, the material should all go out at the same speed at the same time. But if the star is being SASI (get it? sassy? ), the internal velocities and distributions of its plasma are not homogeneous, so the explosion won't be, either. And from a "process of science" standpoint, I think it's cool that the team can find experimental evidence to support the results of their 0101010110 supernovae. The neutrinos that we receive on Earth and the gravitational waves that the star's sloshings impress upon spacetime are both detectable (or at least theoretically so). So what are the team members going to do now that they've modeled a supernova? No: According to the press release, they "plan to perform more and longer simulations." Scientists at CalTech simultaneously found a way to stimulate your midbrain without invasive methods (ie: opening up your skull) and make you find them attractive. Chib, et al. reported in Translational Psychiatry that by using their newly designed noninvasive method called transcranial direct current stimulation (tDCS) on the prefrontal cortex they were able to activate the interconnected midbrain. Why would you want to activate the midbrain? The ventral midbrain (also known as: the substantia nigra and ventral tegmental area) is the location of a group of very important dopaminergic neurons (neurons whose primary neurotransmitter is dopamine). These dopaminergic neurons are involved in reward, addiction, movement, cognition, motivation, intense emotions like love, and many more things. TL;DR – they’re important. The neurons project into multiple areas of the brain and impairments in these neurons have been associated with a number of neurological and neuropsychiatic disorders such as Parkinson’s disease, depression, and addiction. When impairment occurs the most popular means of influencing these impaired neurons is through pharmacological intervention or deep brain stimulation. Pharmacological intervention will not be region-specific, and will influence the dopamine levels throughout not only the nervous system, but also other systems including the immune system, the pancreas, etc. And, well, deep brain stimulation is Deep. Brain. Stimulation… wherein neurosurgeons drill a hole into your skull and implant a device that is essentially a brain pacemaker. This device will send electrical impulses to where ever the electrode is placed. Though it sounds medieval, this treatment has been successful in treating symptoms of Parkinson’s disease, depression, dystonia, etc. Previously (meaning before this study), the only means of non-invasive stimulation of the brain was through methods that could only stimulate neurons on the cortical surface, not anywhere near the ventral midbrain. One of these methods is called transcranial direct current stimulation, which has been shown to be able to influence midbrain neurons by stimulation of the frontal cortex. tDCS applys a small current between anodal and cathodal electrodes placed on the scalp, in this case they would be placing the electrodes on the prefrontal cortex in effort to induce activation of dopaminergic neurons in the ventral midbrain. Is this where the good-looking people come in? Well, they needed a read-out. Turns out the ventral midbrain is also important in determining attractiveness of other people. Here’s the set up: The experiment was divided into three sessions. The first session (before stimulation) participants made “facial attractiveness judgements”, during the second session participants were stimulated via tDCS for 15 mins, and during the final session (after stimulation) participants again made facial attractiveness judgments. There were three experimental groups, the main condition which was the group that received the tDCS treatment (anodal stimulation of the ventromedial prefrontal cortex and cathodal stimulation from the right dorsolateral prefrontal cortex), the sham group that received no stimulation, and the active sham group that received stimulation with the anode and cathode switched. As the graph depicts, the group that received the tDCS treatment perceived a higher attractiveness level after stimulation. Though the attractiveness level was a great read-out, they also quantified this behavior by measuring activation with functional magnetic resonance imaging (fMRI). fMRI scans show that tDCS treatment induced a larger effect size and that increased with perceived attractiveness levels. This was the very first time that anyone has shown tDCS directly yields both stimulation-induced changes in the brain connectivity AND corresponding behavioral changes – which makes the future bright for using tDCS in the clinic for treating Parkinson’s disease and psychiatric disorders. Basically, all of the researchers got a wicked paper and a hot date out of this study. Copyright © 2013, Smaller Questions. All rights reserved.